Doing the intracoastal waterway on a pontoon boat? I am thinking about doing the intracoastal waterway on a 20 foot pontoon boat. Hi my name is Don and I live in Florida, and with the following closure I'm wondering if anybody has attempted this yet. And if there is anyone that knows anything about doing this I would appreciate the feedback. Hope to hear from somebody about this project soon. Thanks for your help, Don. Well Don, thanks for sharing your post with the community. When it comes to doing the ICW (Intracoastal Waterway), which is basically a canal most of the way, and also has wide/rough bodies of water. I have heard stories about all kinds of people attempting it in various size boats. I know of people that can cross "small oceans" in specially built rowboats, and most "make it" and some don't. So, with that in mind, I would recommend reading some of the following articles to help you make a decision whether it's a good idea, or simply a thought that should be put aside. 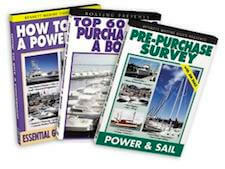 You don't mention if, or how much boating experience that you have, so I would also recommend some Power Squadron Boating Courses to at least start things off. 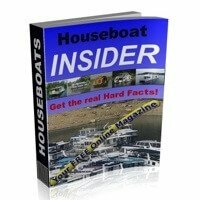 Lastly, hopefully some of our readers will share and post comments about their ICW Intracoastal Waterway houseboat experiences and tips. Feel free to use the "Click here to post comments." link found near the bottom of this page. Comments for Doing the intracoastal waterway on a pontoon boat? I have traveled the ICW many times with a small vessel (20ft Sea Hunt), a 28ft pontoon house boat, and finally a 54ft Meridian. 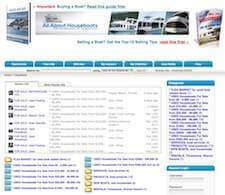 There are B-n-B's, boatels and hotels virtually the entire route, you just need to do your homework (a lot of Capt. meetings). Our last trip with the Meridian was accompanied by a couple in a 24ft Sea Ray (bow rider). They ran with us everyday and had a blast but planned accommodations in advance (We had a full vessel so they could not stay onboard with us). We made some itinerary adjustments for them that were well worth the effort. You don't need a large vessel, just common sense and a willingness to stay in port on bad weather days. Our longest trip was 36 days planned out as 9 days per month (Sept. through December, NY to KW). Michele, I don't know if you'll see this, but doing the A- ICW in your big sailboat would be just great. There is a regular parade of snowbirds headed for Florida in the fall, and the same headed back to New England in the spring. The intrepid soul looking to find lodging along the way might consider packing a tent to pitch for privacy and bug-free comfort for those nights when shore-side hotel rooms are scarce. Some areas will have luxury Marina-side hotels aplenty, and other stretches are miles and miles of scenic wilderness or chock-a-block luxury homes, with no room-for-rent signs. There are lots of stretches of no-wake zones where your 40-knot speed-barge will be no faster than the big tug ahead with a tow, so you might not make the distance you figure on paper. Take along your smart phone or hotspot, and you can perhaps find a fine room through such services as Couchsurfing.com or AirBnB.net. Hosts might be happy to come pick you up, and offer grand hospitality. Sure, go for it.... maybe. As previously noted, the canal stretches of the ICW are fine, if you know your rules of the road, signals, navigation, and understand just because you have the right-of-way, doesn't mean the oncoming or overtaking vessel is going to give it to you. Better to yield to the dimwits than to risk a collision or confrontation. Take your time. And mind your own good boat manners. Also on the take-your-time list is weather. Especially weather. 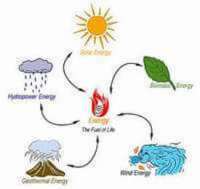 Check the NOAA weather report carefully! Do NOT try to cross the big east coast bays and sounds if the wind is or is forecast to become more than 10 knots or the waves forecast for more than 1 foot. With the low freeboard on a pontoon boat, you do NOT want to be out in the middle of the sound, pitching and rolling in 3 foot chop. Believe me, it can be nasty! You do not want to be on these open waters if you see big thunderclouds bearing down on you. The Albemarle Sound, which is the one I live and boat on, can be calm as a duck pond, or in the blink of an eye, it can give you the scare of a lifetime, and beat you and your boat up. Find a nice place to tie up, and wait until the perfect quiet morning offers you a good passage. Allow more time and fuel than you think you will need. Speaking of fuel, there are long stretches where none is available. Don't risk running short. Hugging the coastline is a great idea--- for some coasts. Not this one. Our shores are unpredictably shoally and often swampy, with snags, logs, wrecks, cypress trees and cypress knees encroaching far out into the water, with water so dark it's hard to see the boat biters. Also, around here in the Albemarle Sound, gill nets and crab pots by the hundreds, especially in summer and fall, are ready to snag the unwary boater. Sticking to the marked channel is safer. If it's too rough in the channel, it's just too rough to be out. Talk to local boaters, ask for good advice. Listen on your boat's radio, for weather, traffic and ride reports. Just be smart, and don't rush it. It's beautiful territory, lots to see and enjoy, grand historic towns, great places to stop and eat, incredible wildlife and serene backwaters to explore, but know this: you cannot be on a tight schedule for this trip. If you make the trip, do stop in historic Edenton, NC, on the western edge of the Albemarle Sound, and visit. Many of the municipal marinas in the area offer at least two nights docking for free. Did I mention you dare not be in a hurry, you dare not push the weather? I surely meant to. My husband wants to sail the ICW in a 35' sailboat. I'll go but am not a sailor and heeling scares me something awful. Is it even worth a try or will we be hitting the divorce courts before we're through. Goal is Miami to Baltimore, 2 weeks sailing, then home for a week over and over till we get to Baltimore. What think you experienced boating peeps? Weather - Best be in cover as too much windage and too light a vessel. Really you are a kite. Have 2 outboards or inboards. One goes and you have a 16+ beam.... you can become a merry-go-round. Night Security - There are a lot of flipcakes that will mess with anything they can. From starting your vessel and push to full speed and they hop overboard - board to steal or to watch Ladies sleep. Finally a good dog - and you will sleep well until a barge bear jumps aboard. Dog goes overboard and I am following him. They'll barge in anywhere. Most dangerous mammal on the Intracoastal is a drunk man OR women. Causes DEATHS ever year. Take control of the boat, tie them up and call Florida Patrol. I am planning a trip on the ICW sometime next year after spring. I wanted to know or get an idea of how long it might take me to get from Hilton Head ICW to the Chesapeake Bay. 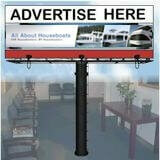 I planning the trip on a 28 foot Bayliner cruiser. Thanks you in advance to anyone that shares information with me. My name is Wally and my question is what would be a good boat to purchase to only do the icw/ canals etc... going back and forth from cape coral to sanibel/ ft meyers with my wife who has muscular dystrophy and may be in a wheel chair? I do very little fishing so it doesn't have to be a fishing boat per say. But I think I would like it to be a minimum of 24 to 26 ft. Any ideas? Pontoon houseboat on the ICW? Just wondering if you ever got away and took your boat up the ICW? If not, we are heading north in about 6 weeks up to the Chesapeake Bay from south Florida. It is late January and we intend to leave here around March sometime. Possibly leaving Fort Myers and heading down around the Keys and up the ICW all the way to the northern Chesapeake Bay at an idle. An awesome trip if you have never done it. Actually, it's awesome even if you have done it twenty times or more. Keep in touch. 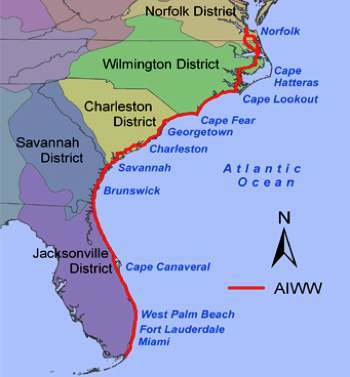 Okay, I have run the ICW several times from the upper Chesapeake to Panama City Beach and beyond. I have seen and met people with boats ranging from a 17 foot open fishing boat, a 20 foot Wellcraft with cutty cabin, a 27 foot sailboat and even one guy in an 8 foot pontoon seat-boat like you would use for a very small fishing boat. All said they were having the greatest time in the world. Personally, I would like a bit larger boat but have run my old 26 foot pontoon boat down the Chesapeake to Norfolk and went from Morehead City to Norfolk in a 10 foot wooden rowboat with a 15 hp outboard back in the early 80's. One guy down in the Keys was traveling with a kayak piled up with a backpack and fishing rod. He said he came down from Canada. As for crossing open water... Not a great idea on a small pontoon boat but if you really watch the weather and hug the shoreline until you have a fabulous crossing day I suppose it can be done. I have crossed Pamlico and Albamorrow sounds with glass like water and have also seen them and many other areas as raging lunitics. The main thing is to know your limitations and those of your equipment. 90% of the ICW is narrow and calm other than the idiots in megayachts trying to get somewhere in record time. Watch out for those wakes.....If I was 40 years younger I'd join such an adventure. Russell. My wife and I are considering cruising the intracoastal from St. Augustine through the Keys. We will be doing this on a 2014 23' Avalon LS, TRITOON, with a Honda 150 hp 4 stroke. My main concern is accommodations for sleeping along the way. 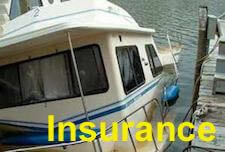 This boat is very comfortable and economical but is not set up for sleeping aboard. Can anyone give me a little insight to look forward to as far as choices, cost or any other information that may be of value to us. We are in our early 60's and will have plenty of time to enjoy our trip and plan on staying in Marathon Key for a week or two before making our return trip.